Simcoe native George Pond exemplified versatility, good sportsmanship and dedication. In high school George excelled in basketball, football, tennis, badminton and track and field and participated successfully in every sport available. He did not leave his talents on the playing surfaces. He was a student leader in every sense of the word and volunteered his talents to a number of school organizations. One of George’s greatest accomplishments and perhaps his proudest moment in team sports came when he was a teenager. In 1952, he coached the Simcoe “Three Links” Bantam baseball team to one of Simcoe’s first all-Ontario Championships. He was an innovative coach and introduced his team to the ‘sacrifice squeeze play’ prompting other coaches to complain that he must have broken some rule. George’s versatility and love of sport continued long after his high school days were over. As an adult, he was a talented member of many successful baseball, fastball and hockey teams. 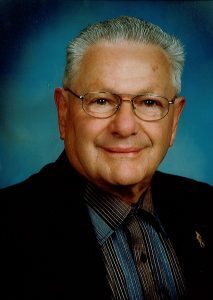 George was a valued member of the Simcoe Giants baseball team that won Ontario championships in 1960 and 1965 as well as the Intermediate “A” Major Ontario Baseball Association Championship in 1967. For several years George was a standout with the Villa Nova Milk Co-ops, a highly successful and well-known fastball team that played home games in Waterford. George helped the Co-ops win the Ontario Intermediate “B” championship in 1961. George was also a valuable member of the Simcoe Old Timer’s hockey team that brought many accolades to Simcoe, not only locally but provincially, nationally and internationally in the 1970s and 80s. If any further proof of his versatility and talent is needed, it should be noted that George played two or three years with the Simcoe Men’s Soccer team in the early 1950s and also played on a Simcoe minor lacrosse team. Later in life, organizing and fundraising consumed much of George’s time, as well as collecting, researching and cataloguing hundreds of photos of local athletes and teams. As a ‘Builder’ George continued to impact the sporting landscape. For 12 years George was the secretary-treasurer of the Southern Counties Baseball Association. George’s impact on the community was not confined to sports. As a long-time member of the Simcoe Lion’s Club, George spent countless hours fundraising for the many and varied facilities and programs that the Lions support. He took particular pride in his efforts to help get lights for Memorial Park and the building of Lion’s Park on Davis Street in Simcoe. As well, at the time of his induction, George, an avid birder, had raised over $100,000 for Bird Studies Canada during the Baillie Birdathons.